The Beinecke Rare Book & Manuscript Library’s iconic building today closed for renovation. It will reopen in September 2016 equipped for another 50 years as a world-class center of scholarship and learning. 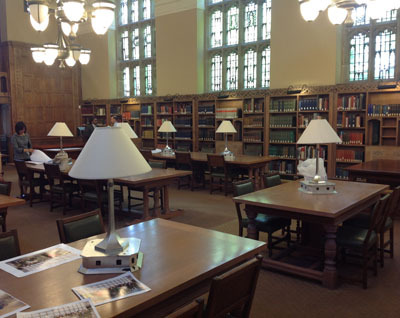 A temporary reading room that opened today in Yale’s Sterling Memorial Library will provide researchers access to the library’s collections throughout the renovation. The reading room operates Monday through Friday, 9 a.m. to 4:45 p.m. It is located in the Franke Family Reading Room, immediately to the left of Sterling Library’s main entrance. Due to constraints caused by the renovation, paging collection material will take longer than usual. Researchers must request collection material online at least two business days in advance of their visit. Some material may be temporarily unavailable. Check the closed collections schedule when planning a research visit.